GAO-09-709: Published: Jun 18, 2009. Publicly Released: Jun 18, 2009. Video clip provides a close-up of a representative sample of firearms recovered near the Southwest Border and in Mexico to include the following: 7.62x39mm caliber AK type semiautomatic rifle, .223 caliber AR type semiautomatic rifle, 5.7mm caliber rifle, 9mm caliber semiautomatic pistol, 5.7mm caliber semiautomatic pistol, .38 Super caliber semiautomatic pistol, .40 caliber semiautomatic pistol, and .50 caliber semiautomatic rifle. Video courtesy of ATF. In recent years, violence along the U.S.-Mexico border has escalated dramatically, due largely to the Mexican government's efforts to disrupt Mexican drug trafficking organizations (DTO). U.S. officials note the violence associated with Mexican DTOs poses a serious challenge for U.S. law enforcement, threatening citizens on both sides of the border, and U.S. and Mexican law enforcement officials generally agree many of the firearms used to perpetrate crimes in Mexico are illicitly trafficked from the United States across the Southwest border. GAO was asked to examine (1) data on the types, sources, and users of these firearms; (2) key challenges confronting U.S. government efforts to combat illicit sales of firearms in the United States and stem the flow of them into Mexico; (3) challenges faced by U.S. agencies collaborating with Mexican authorities to combat the problem of illicit arms; and (4) the U.S. government's strategy for addressing the issue. GAO analyzed program information and firearms data and met with U.S. and Mexican officials on both sides of the border. Available evidence indicates many of the firearms fueling Mexican drug violence originated in the United States, including a growing number of increasingly lethal weapons. While it is impossible to know how many firearms are illegally smuggled into Mexico in a given year, about 87 percent of firearms seized by Mexican authorities and traced in the last 5 years originated in the United States, according to data from Department of Justice's Bureau of Alcohol, Tobacco, Firearms and Explosives (ATF). According to U.S. and Mexican government officials, these firearms have been increasingly more powerful and lethal in recent years. 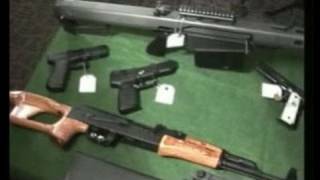 Many of these firearms come from gun shops and gun shows in Southwest border states. U.S. and Mexican government and law enforcement officials stated most firearms are intended to support operations of Mexican DTOs, which are also responsible for trafficking arms to Mexico. The U.S. government faces several significant challenges in combating illicit sales of firearms in the United States and stemming their flow into Mexico. In particular, certain provisions of some federal firearms laws present challenges to U.S. efforts, according to ATF officials. Specifically, officials identified key challenges related to restrictions on collecting and reporting information on firearms purchases, a lack of required background checks for private firearms sales, and limitations on reporting requirements for multiple sales. GAO also found ATF and Department of Homeland Security's (DHS) U.S. Immigration and Customs Enforcement, the primary agencies implementing efforts to address the issue, do not effectively coordinate their efforts, in part because the agencies lack clear roles and responsibilities and have been operating under an outdated interagency agreement. Additionally, agencies generally have not systematically gathered, analyzed, and reported data that could be useful to help plan and assess results of their efforts to address arms trafficking to Mexico. U.S. law enforcement agencies have provided some assistance to Mexican counterparts in combating arms trafficking, but these efforts face several challenges. U.S. law enforcement assistance to Mexico does not target arms trafficking needs, limiting U.S. agencies' ability to provide technical or operational assistance. In addition, U.S. assistance has been limited due to Mexican officials' incomplete use of ATF's electronic firearms tracing system, an important tool for U.S. arms trafficking investigations. Another significant challenge facing U.S. efforts to assist Mexico is corruption among some Mexican government entities. Mexican federal authorities are implementing anticorruption measures, but government officials acknowledge fully implementing these reforms will take considerable time, and may take years to affect comprehensive change. The administration's recently released National Southwest Border Counternarcotics Strategy includes, for the first time, a chapter on combating illicit arms trafficking to Mexico. Prior to the new strategy, the U.S. government lacked a strategy to address arms trafficking to Mexico, and various efforts undertaken by individual U.S. agencies were not part of a comprehensive U.S. governmentwide strategy for addressing the problem. At this point, it's not clear whether ONDCP's "implementation plan" for the strategy, which has not been finalized, will include performance indicators and other accountability mechanisms to overcome shortcomings raised in our report. Comments: On September 17, 2009, in a letter to the Chairman of the Senate Committee on Homeland Security and Governmental Affairs, the Department of Justice (DOJ) stated that a report along the lines recommended by GAO was not warranted and thus the Department did not agree with this recommendation. Responding to subsequent inquiry by GAO in 2011, DOJ officials reiterated that the Department did not believe that such a report was warranted and the recommendation would not be implemented. Recommendation: The U.S. Attorney General should prepare a report to Congress on approaches to address the challenges law enforcement officials raised in this report regarding the constraints on the collection of data that inhibit the ability of law enforcement to conduct timely investigations. Comments: The Departments of Justice and Homeland Security both agreed with our recommendation. ATF and ICE signed a new Memorandum of Understanding on June 30, 2009, that clarifies the agencies' roles with respect to arms trafficking investigations and allows for changes to the MOU. According to the ATF, since that time ATF and ICE have collaborated on many investigations involving the trafficking of arms and meet regularly to discuss ongoing issues related to interagency efforts to stem the flow of weapons to Transnational Criminal Organizations operating in Mexico. According to ICE, the two agencies now have outstanding cooperation and information sharing. Further, ICE has also developed a framework for monitoring implementation of this MOU by regularly soliciting information from ICE offices on any coordination issues that could not be resolved under the MOU and sharing this information with ATF. Recommendation: To further enhance interagency collaboration in combating arms trafficking to Mexico and to help ensure integrated policy and program direction, the U.S. Attorney General and the Secretary of Homeland Security should finalize the Memorandum of Understanding between ATF and ICE and develop processes for periodically monitoring its implementation and making any needed adjustments. Comments: In response to the GAO recommendation, DOJ said ATF currently compiles and publishes trace data regarding firearms seized and traced by law enforcement agencies within the U.S., and also firearms recovered in Mexico. ATF currently provides summary trace data to U.S. law enforcement agencies with regard to firearms that each particular agency seizes and traces. In addition, ATF produces two annual reports that provide aggregate firearms trafficking data and trend analyses with information specific to arms trafficking to Mexico. Recommendation: To help identify where efforts should be targeted to combat illicit arms trafficking to Mexico, and to improve the gathering and reporting of data related to such efforts, the U.S. Attorney General should direct the ATF Director to regularly update ATF's reporting on aggregate firearms trafficking data and trends. Comments: In correspondence from April 2011, the Department of Justice (DOJ) agreed with this recommendation in GAO's report and provided details on how DOJ along with DHS has implemented this recommendation. In correspondence from May 2011, DHS corroborated the information provided by DOJ and agreed with DOJ that the recommendation has been implemented. On August 13, 2009, DOJ signed a letter of intent with DHS and the Mexican Attorney General to develop a coordinated and intelligence driven response to the threat of cross border smuggling and trafficking of weapons and ammunition. On June 30, 2009, ATF and ICE updated a MOU that addresses how the two agencies will work together on investigations of international firearms trafficking and possession of firearms by illegal aliens. According to DOJ, this MOU provides a framework for both agencies to share intelligence and conduct investigations and will help ensure that the resources of both agencies are utilized in a more efficient and coordinated manner. DOJ also said that on June 18, 2009, the Drug Enforcement Agency (DEA) and ICE entered into a MOU that memorializes both agencies' commitment to information sharing. Under this MOU, ICE will participate fully in both the Organized Drug Enforcement Task Force Fusion Center and the DEA Special Operations Division. The Fusion Center is a comprehensive data center that provides intelligence and investigative support to ATF, DEA, the Federal Bureau of Investigation and the Internal Revenue Service, among others. All investigative reports, records and subject indexing records from open and closed investigations, including those related to weapons will be shared. According to DOJ, since their initial response to our report, ATF has established a robust working relationship with the newly created Border Intelligence Fusion Section that is managed by DHS. ATF routinely shares information and intelligence with ICE, such as intelligence bulletins and monthly open source reports, detailing firearms trafficking trends and related intelligence. ATF and ICE are also coordinating a joint, bi-national firearms trafficking assessment which evaluates the nature and scope of the issue within the U.S. and Mexico. Recommendation: To help identify where efforts should be targeted to combat illicit arms trafficking to Mexico, and to improve the gathering and reporting of data related to such efforts, the U.S. Attorney General and the Secretary of Homeland Security, should, in light of DHS's recent efforts to assess southbound weapons smuggling trends, direct ATF and ICE to ensure they share comprehensive data and leverage each other's expertise and analysis on future assessments relevant to the issue. Comments: In response to the GAO recommendation, DOJ noted that the Bureau of Alcohol, Tobacco, Firearms and Explosives (ATF) compiles and publishes trace data regarding firearms seized and traced by law enforcement agencies within the U.S., and also firearms recovered in Mexico. According to DOJ, ATF currently provides summary trace data to U.S. law enforcement agencies with regard to firearms that each particular agency seizes and traces. In addition, ATF produces two annual reports that provide aggregate firearms trafficking data and trend analyses with information specific to arms trafficking to Mexico. According to DHS, Immigration and Customs enforcement (ICE) law enforcement systems also can capture, track, and provide statistical information on all ICE investigations as well as associated seizures and enforcement actions against individuals linked to criminal behavior. Recommendation: To help identify where efforts should be targeted to combat illicit arms trafficking to Mexico, and to improve the gathering and reporting of data related to such efforts, the U.S. Attorney General and the Secretary of Homeland Security should ensure the systematic gathering and reporting of data related to results of these efforts, including firearms seizures, investigations, and prosecutions. Comments: The Department of Justice (DOJ) provided information on how it has implemented this recommendation. State concurred with DOJ that the recommendation had been implemented as DOJ reported. In December 2009, ATF disseminated eTrace in Spanish to Mexican law enforcement agencies. In October 2010, the Mexican Attorney General and the Bureau of Alcohol, Tobacco, Firearms and Explosives (ATF) signed an MOU whereby Mexico agreed to comprehensively trace all recovered firearms through ATF's eTrace system. ATF has also agreed to provide access to the eTrace system, and further provide training to designated Mexican law enforcement personnel in the use of eTrace. Since the signing of the MOU, ATF has trained over 130 Mexican personnel in six classes with two additional classes scheduled for the remainder of 2011. Recommendation: To improve the scope and completeness of data on firearms trafficked to Mexico and to facilitate investigations to disrupt illicit arms trafficking networks, the U.S. Attorney General and the Secretary of State should work with the Government of Mexico to expedite the dissemination of eTrace in Spanish across Mexico to the relevant Government of Mexico officials, provide these officials the proper training on the use of eTrace, and ensure more complete input of information on seized arms into eTrace. Comments: In a June 2013 letter, ONDCP outlined steps it had taken in response to GAO's recommendations and provided examples of how ONDCP had implemented these recommendations in its 2013 National Southwest Border Counternarcotics Strategy. These included identifying needs, such as improving information sharing related to weapons trafficking, increasing the interdiction of illicit weapons shipments to Mexico, and enhancing cooperation with international partners. The 2013 strategy sets the strategic objective of stemming the flow of illegal weapons across the Southwest border into Mexico and actions for addressing needs related to this objective, such as expanding intelligence-driven interdiction of illicit weapons shipments destined for Mexico through multi-agency investigative efforts, partnering with the Government of Mexico in bilateral investigation and interdiction activities to identify and dismantle criminal weapons-trafficking networks, and assigning U.S. criminal investigators to locations throughout Mexico. The strategy leverages the expertise of relevant agencies by clearly identifying the agencies/components responsible for carrying out each objective. The strategy also establishes a measurable indicator for assessing progress toward this objective--specifically, the number of firearms seizures with a nexus to Mexico. The strategy outlines resources that will be provided, such as additional staffing, and establishes mechanisms to facilitate information sharing and coordination across agencies. ONDCP established the Southwest Border Executive Steering Group as an ongoing strategy review mechanism that meets several times each year to assess progress. In preparation for these meetings, ONDCP requests that each agency produce a written assessment--for review by ONDCP and other agency participants--of its progress in implementing the strategy's supporting actions. By incorporating these improvements into its 2013 National Southwest Border Counternarcotics Strategy, ONDCP has addressed the weaknesses GAO found in 2009 and implemented the recommendation made in GAO-09-709. Recommendation: To support the 2009 Southwest Border Counternarcotics Strategy, the Office of National Drug Control Policy (ONDCP) Director should ensure that the implementation plan for the arms trafficking chapter of this strategy (1) identifies needs and clearly defines objectives for addressing those needs, (2) identifies roles and responsibilities for meeting objectives that leverage the existing expertise of each relevant agency, (3) ensures agencies are provided guidance on setting funding priorities and providing resources to address those needs, (4) establishes mechanisms to facilitate coordination across agencies, and (5) employs monitoring mechanisms to determine and report on progress toward objectives and identifies needed improvements.